Exceptional radio talk show ‘Eco Talk’ is being broadcast at 02.05 pm on every Saturday over Bangladesh Betar Rajshahi Centre. With the support of European Union, mass communication oriented development organization CCD took this initiative of radio talk show. The main objective of this talk show is to highlight the success, learning and experience of different economic activities of the Government and non-government organizations implemented in the northern region of the country, so that many more people and organizations are encouraged to take initiative of such economic development activities. Three of the talk shows have already been broadcast over Bangladesh Betar Rajshahi Centre at 01.30 on last three Saturdays. But considering the request of the listeners the next talk shows will be broadcast at 02.05 on every Saturday from 14 April onward. From the perspective of the remarkable success of Bangladesh in presenting micro credit model, the topic of the first four talk shows is micro credit. 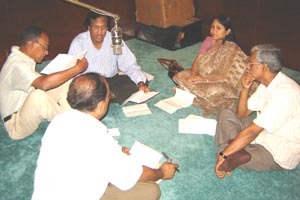 In these talk shows, a number of educationists, development workers, higher officials of Government and non-government organizations and beneficiaries actively took part in the discussion and tried to focus on success, failure, role, achievement and limitations of the GO and NGOs in poverty reduction through micro credit. At the same time, it focused on how the poor people became self-reliant and self-employed through taking micro credit and changed their socio-economic status in the locality. Renowned educationists, development workers, higher officials of Government and non-government organizations, experts, intellectuals, industrialists, business leaders and entrepreneurs will take part in the talk shows. 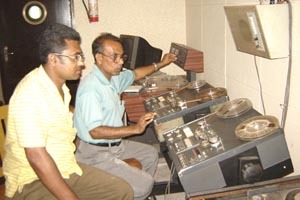 Director of CCD G M Mourtoza and Md Sharif Uddin are respectively producing and presenting the radio talk shows. I feel very joyous and proud, to hear that, we who were able to make change in our life and reduced poverty with the help of micro credit system, the success of that people are broad casting in Radio. In this way Kanij Fatema expressed her reaction after hearing the talk show ‘Eco Talk’ (Eco Talk) broadcast from Rajshahi radio by CCD. Her house is at Chhoto Bongram in Rajshahi city. She has set up a handicraft factory in her house by taking micro credit. After receiving her letter, she was invited to the talk show and she told the story of her winning poverty through small effort of handicrafts by using micro credit. For promoting local economic and trade in northern region of Bangladesh, CCD broadcasting a talk show series incorporated with 22 programs to inform the common people through Radio. At the very out set Rajshahi Radio denied to broadcast it because of the emergency situation of the country as it is state-run media organization. But as the talk show was for the humanity so at last it has been began broadcast from 24 March 2007. In the mean time a total of eight talk shows have broadcast with covering role of micro credit in reducing the poverty, problem and prospect of mango, rajshahi slick and other issues. In the talk shows four successful credit talkers talked about their experience and success after taking and using micro credit in their own life. The higher officials of the organizations from which they took help also participated in the program. For reducing the poverty both in Bangladesh and out side the country, the role, success, teaching and limitation of micro credit system and to operate their micro credit program, the role of NGO, Government and non-government organization has been launched in this program. Remarkable economist, professors of universities, NGO leaders and the higher officials of the banks participated in the talk show and discussed their roles and activities. The talk show was produced by Director of CCD G. M. Mourtoza and presented by Sharif Uddin, a noted radio personality.